Making healthy eating choices like choosing a bowl of salad over french fries is simple. But choosing your oils and knowing which ones are safe to cook can be a little trickier. All oils are composed of different types of ‘fats’ in its profile. This is important to understand because each type of ‘fat’ has varying tolerance levels in becoming rancid from heat, air, and light exposure. Here is a quick breakdown of the different oils and their fat profiles. Mono-Unsaturated Fat: Mono-unsaturated fats are fluid and are generally liquid at room temperature. Under light, air and heat exposure mono-unsaturated fats become rancid. Oils with a high concentration of mono-unsaturated fats include avocado oil, sesame oil, and olive oil. Poly-Unsaturated Fat: Poly-unsaturated fats are even more fluid than mono-unsaturated fats and stay liquid even in the refrigerator. They also turn rancid very easily, especially under high temperatures. Oils with a high concentration of poly-unsaturated fats include flax oil, hemp oil, chia oil, and walnut oil. Saturated Fat: Saturated fats stay solid in room temperature and are highly stable fats. They don’t have the same tendency toward rancidness as polyunsaturated fats, even if heated. Saturated oils include butter, coconut oil, and ghee. Trans Fat: Trans fat is produced when oils are chemically treated under a process called hydrogenation, which makes oils more shelf stable. Oils that are processed transform into unrecognizable molecules in the body which leads to inflammation, atherosclerosis and a host of other health ailments. 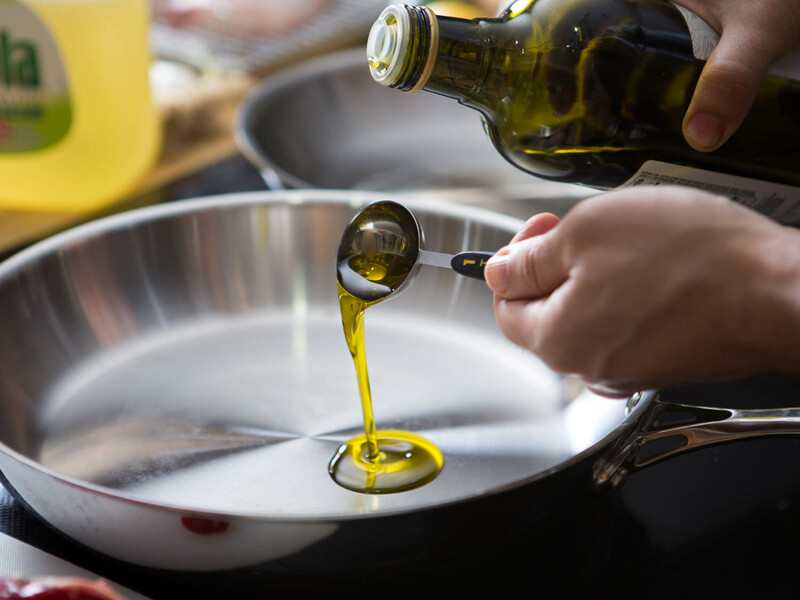 Many common cooking oils are hydrogenated oils such as canola oil, cotton seed oil, safflower oil, sunflower oil, rapeseed oil. In summary, saturated fats like coconut oil, butter, and ghee are the best for sautéing, frying, and baking. Mono and poly unsaturated fats like olive oil, hemp seed oil, avocado oil are best as salad or pasta toppers. Use this handy guide to find out what oils are suitable for cooking, taken from the Academy of Culinary Nutrition. Jollia is passionate about nutrition, crazy about whole foods, and is always on the hunt for healthy recipe inspirations. She’s also the blogger at RosyCheeksProject where she writes about optimal gut health and shares her favourite gut-healthy recipes. You can catch her in action on Instagram (@rosycheeksproject) or see what’s brewing in her kitchen at RosyCheeksProject.com.